Patroclus (Ancient Greek: Πάτροκλος, Pátroklos - "glory of the father") was a central figure in Homer's Iliad. He was the son of Menoetius, and is most famous as being the dear companion of Achilles. During the Trojan War, Achilles refuses to fight after a quarrel with Agamemnon, leader of the Greek forces. Patroclus, with Achilles' permission, then dons Achilles' armor and leads the Myrmidons into battle. The Greeks, thinking him to be Achilles, are routed into a frenzy as they begin to beat the Trojans back. However, the rouse is discovered as Patroclus is soon killed by the Trojan prince Hector. 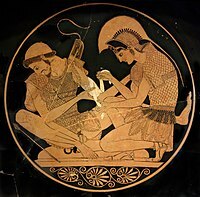 The death of Patroclus is a key event in the Iliad, as it serves as the catalyst of Achilles' legendary rage. Wikimedia Commons has media related to Patroclus. This page was last changed on 23 February 2018, at 20:09.